We all have been there, some of us still are there, and we will always have piano students who need help learning their notes. How do we help piano students learn to read notes on the piano and remember what those notes are? Everyone learns differently so everyone will have their own way of learning and remembering the note names on and off of the staff. That’s okay! One way is not necessarily better than another because what works for one person will not necessarily work for another. This will be a very basic intro with a FREE PDF handout piano teachers and students can use to learn the names of the notes (at the bottom of this blog post). 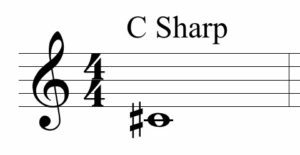 To begin with there are only 7 musical letters used from the alphabet: A, B, C, D, E, F, and G. Each of these can also either have a sharp symbol (#) placed after it or a flat symbol (b – it looks like a lowercase cursive B) which means the original note is taken up half a step (for sharps) or down half a step on the piano (for flats). So in truth, we could have A, B, C, D, E, F, and G, or A#, B#, C#, D#, E#, F#, and G#, or Ab, Bb, Cb, Db, Eb, Fb, and Gb. These 7 musical letters are also arranged on a staff which has 5 lines and 4 spaces. They move up and down alphabetically from space to line and line to space. We can use the spaces and lines of the Treble Clef or Bass Clef to help us remember the note names. I tend to only use sayings for the spaces to help students remember the notes because I have found that teaching them a saying for the notes in the spaces and on the lines can be too confusing (at first), to remember which saying goes with which clef, space, line, etc.. What is nice about the notes on the clefs is that they follow a pattern of spaces and lines and move up and down alphabetically meaning if the student learns the names of the notes in the spaces they can then find out the names of the notes on the following or preceding line because it is the letter before or after the letter in the space according to the alphabet. Now I normally don’t use mnemonic sayings to memorize the notes in my own teaching and prefer instead to use what I refer to as the 7 Markers of Musical Success. You can click on this image below to download the FREE PDF on learning to read notes that way. Here is an additional way of learning the notes. You can choose which way you prefer. I use both depending on the student because what works for one student does not always work for another. Some prefer using mnemonic devices to memorize the notes on the staff and others prefer to use the landmark method similar to the one presented above in the 7 Markers of Musical Success. As long as you learn your notes it really does not matter how you learn them. 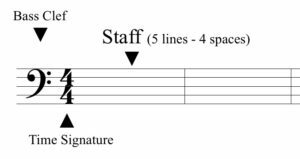 The important part is that you learn to read music and quickly identify the names of the notes on the staff either in the spaces or on the lines. I hope this helps as well! 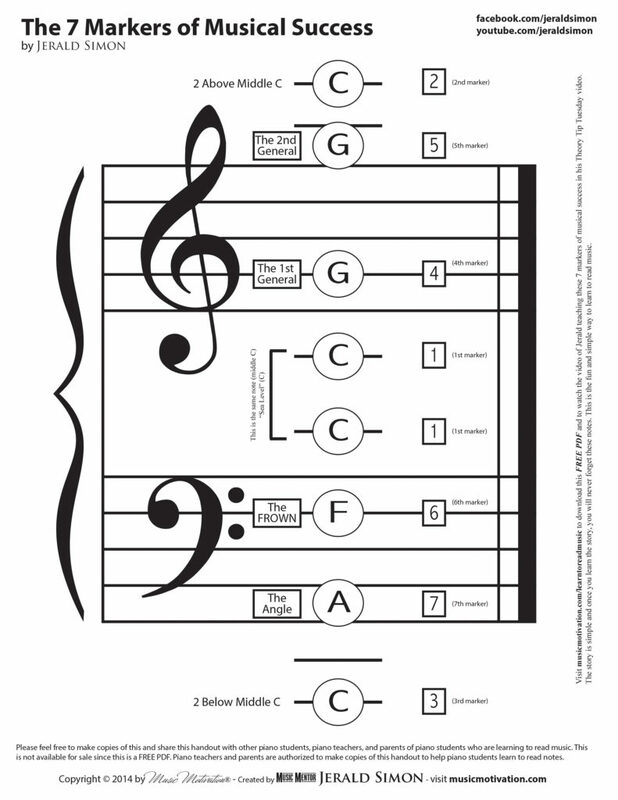 Now that you have a very basic understanding of the names of the notes on the Treble and Bass Clefs and also above and below the ledger lines, here is a FREE PDF download you can download to better learn to read notes. 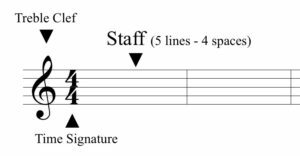 The first PDF focuses on the Treble Clef notes – first the notes in the spaces, and second the notes on the lines of the staff then both together. 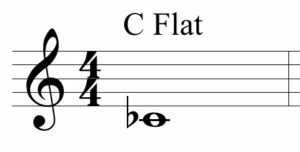 The second PDF focuses on the Bass Clef notes – first the notes in the spaces, and second the notes on the lines of the staff then both together. Please feel free to have your piano students download these FREE resources by clicking on these FREE PDF downloads below. 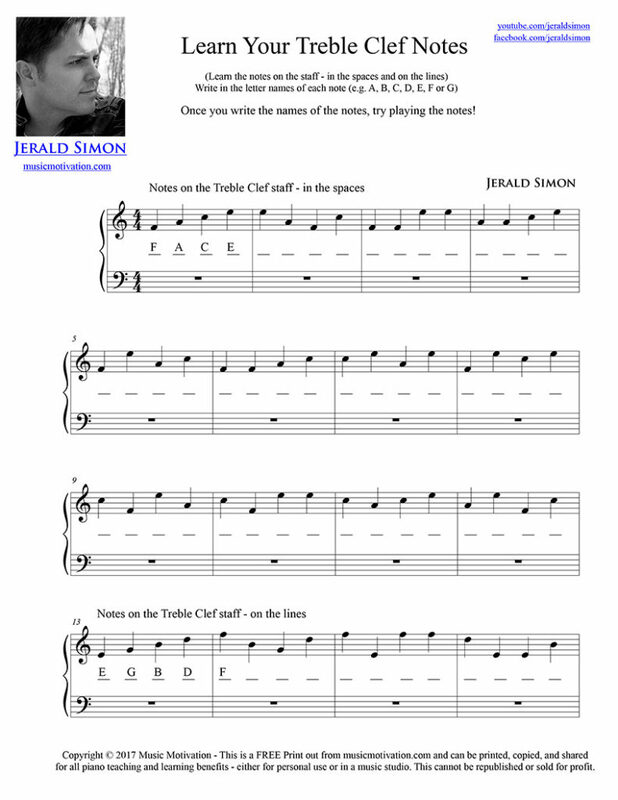 You may make copies of this and share this FREE PDF with anyone who needs to learn their notes on the piano.